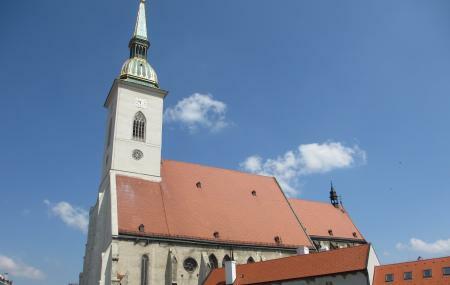 The St. Martin Cathedral is one of the most important buildings in Bratislava. Around 11 coronations were held here over the city’s rich history and even today, its rich Gothic architecture, intricate interiors and peaceful ambience is cherished by locals and tourists alike. The cathedral was built over a Romanesque basilica in the Old town of Bratislava and consecrated in 1452. If you love art, architecture and history, this place is an absolute treat! How popular is St. Martins Cathedral? People normally club together Period Rooms Museum and Bratislava Castle while planning their visit to St. Martins Cathedral. As cathedrals go in Europe this one is decidedly modest however it is certainly worth visiting. The is an impressive statue of St. Martin as well as some nice art work on the side altars. When looking around you should take note of the decorative carvings in the choir. Mass is offered in Latin on Sundays at 09h thoughout the year. The oldest and the most beautiful church in Bratislava full of beautiful decorations, colourful windows with wonderful mosaics. The statues decorating the interior show the rich catholic history of this town and its importance in Hungarian kingdom in the past. Must see point in Bratislava. This 13th-century Gothic Romanesque Catholic cathedral is an iconic landmark of the area. There are a number of memorials that surround this cathedral and it is well worth a visit if you are in the area. Historic and sacral place, unfortunately compromised by near highway. Great organ music. Some sections are restricted - probably as result of keeping tourist buzz controlled. A wonderful church that was the site of many historical events including the coronations of Hungarian monarchs. It is next to the modern main road but that has not affected the buildings charm or looks with it being easily accessible from the old town. It is almost always on the route to the castle so well worth visiting on the way.